The first thing people think of when they hear the word Hybrid is limited travel. A hybrid or plug-in hybrid vehicle can travel the same distances as conventional gasoline-powered vehicles, in some cases father. The only difference is a hybrid offers you the added power of electricity with a gasoline engine. This combination highly benefits drivers who live in an area where the majority of their travel is within 20 miles or they make daily extended-range trips. 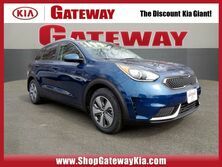 Kia dealers in PA recognize the need for both modes of travel, and Gateway Kia Quakertown is the best place for a Kia deal. For economy conscience people, a hybrid vehicle is the best choice because they can operate strictly on electricity or use electricity to extend daily fuel consumption. So, if you own a hybrid, you can travel back and forth to work, pick up the children from school, shop for dinner, and always be home in time to charge up -and never use a drop of gasoline. Also, if you’re distance is slightly farther, then the gasoline engine kicks in for that final stretch of road. Either way, you travel with confidence and save money on fuel, which is perfect for drivers living near Gateway Kia Quakertown and travel to Philadelphia for work. Although, there other plug-in hybrids to consider, such as the Chevrolet Volt and the Honda Clarity Plug-In, which are not an SUV but offer nearly double the all-electric range over the Niro. 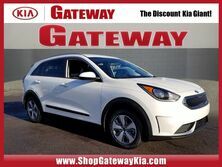 Most of those vehicles can be found at our Gateway Kia dealers in PA. However, for our comparison, we’re using the 2019 Mitsubishi Outlander PHEV (Plug-in Hybrid Electric Vehicle). 2019 Kia Niro Plug-In Hybrid: Leading hybrid in its class. The Niro Plug-In Hybrid is nearly identical to the regular hybrid Niro. The main difference between them is a larger battery. The battery allows for up to 26 miles on electric-only power with the option to be recharged using an external power source. After 26 miles, the Plug-In drives like the standard Niro and averages 105 mpg combined. 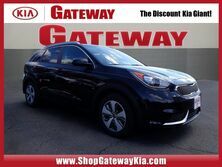 This is perfect for anyone living near our Gateway Kia dealers in PA because you’re within range of several popular metros. In comparison, Outlander’s battery only allows for up to 22 miles on electric-only power with the same recharging option. And likened the Niro, after Outlander’s 22 electric-only miles, it too drives like its standard version, but at only 74 mpg combined. Like all Kia models, the 2019 Niro Plug-In Hybrid is easy to get in and out of and offers plenty of leg room. Also, the interior features are very easy to use compared to the Mitsubishi Outlander. But Kia is an industry leader where driver and passenger comfort and design are concerned, they are always well-equipped off the line. The Outlander also has a comfortable interior, and its style is comparable to top luxury SUVs. Lastly, both vehicles have smartphone integration technology, standard driver assist features such as Blind Spot Warning and Lane Change Assist. Each also includes Anti-lock Brakes, Child seat anchors, and Side/Curtain airbags. Where the Niro Plug-In Hybrid faltered was in its small cargo space behind the rear seats when in the upright position. Kia could have pushed a little harder to stretch the backend a few inches. Obviously, our pick is the Kia but compare for yourself. 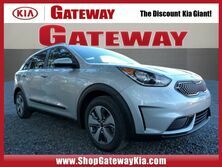 If you’re living near Gateway Kia Quakertown and travel to Philadelphia for work, or you handle all your business in the local area of Quakertown PA, then call ahead and schedule a test drive or stop in. We’ll be happy to answer all your questions.